National Volunteer Centre e-newsletter, Dot.com with a Difference! SingTel i-News, Cancer awareness gets a special boost! 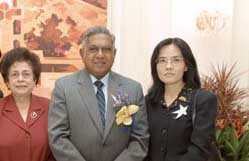 The International Year of Volunteers 2001, Singapore, was launched by President S.R. Nathan at the Istana on 4 December 2000. 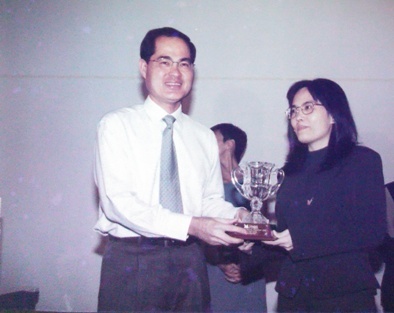 The founder of CancerStory.com, Soh Hong attended its opening ceremony and took photograph with the President and Mrs S.R. Nathan at the Istana. Photograph was taken at the Singapore 21 Fair on Active Citizens, The Wonderful World of Volunteers on 30 June 2001. Support for cancer patients and their care-givers is available online at Cancerstory.com. Set up by a Singaporean woman in memory of her late mother, the non-profit site offers information on financial aid, treatments, support groups and more. Members can also share their experiences in chat rooms and forums.